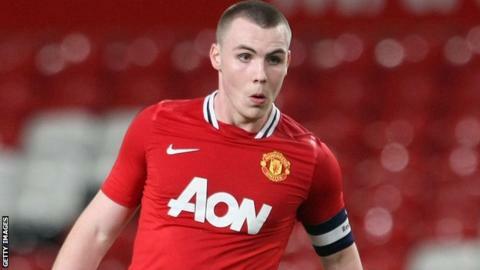 Manchester United youngster Luke McCullough has joined League Two Cheltenham on a month-long loan deal. The 18-year-old defender captained the Red Devils' academy side for the 2011-12 campaign and made 25 appearances. The Northern Ireland U17 international could make his Robins debut on Friday against Rochdale if the Premier League approve his deal in time. "Luke is a proper defender and dominant," Cheltenham manager Mark Yates told the club website. "[Assistant] Neil Howarth has done well in getting the deal to go forward and I would like to thank Manchester United for their help. "It will be a big test for Luke but one I'm sure he will cope well with."